Grandmaster Doc-Fai Wong was born in Wangshan village of Wushan area, Doumen district of Zhuhai City, Guangdong province on 1948. In April 1960, when he was 11 years old, he immigrated to San Francisco with his mother to be reunited with his father. Because of obvious language difficulties in his first few years in this country he was taunted, teased and bullied. It is because of those difficulties that he sought out his first kung fu teacher, Great-Grandmaster Lau Bun, the founder of the Hung Sing Kwoon of Choy Li Fut kung fu in America. After Lau Bun passed away in 1967, he opened his own school when he was 19 years old. He has been teaching martial arts in the San Francisco Bay Area since 1968. Today his Plum Blossom International Federation has over 300 schools and over 2,000,000 members in 39 countries worldwide, making it one of the largest Kung Fu organizations in the world. Branch schools are located throughout the USA, Canada, Central and South America, Europe, Asia, Middle East, Africa, Philippines and even Tahiti! Now, Grandmaster Wong has certified instructors from his students down to the fifth generation teaching in his international federation. He was the Tai Chi Chuan instructor at San Francisco City College from 1974 to 2003. In 2004, he became a voluntary Head Instructor of the Tai Chi Club of the Telegraph Hill Neighborhood Center in San Francisco. In 1975, he went to Hong Kong to search for high ranking masters to improve his martial arts knowledge. He became the disciple of both Great-Grandmasters Hu Yuen Chou and Wong Gong. Both Great-Grandmasters had many students in China when they were young. However, those students were regular come and go students. Doc-Fai Wong was their first official disciple for carrying-on their teaching. Grandmaster Doc-Fai Wong traveled to Hong Kong for his senior advanced level martial arts training each year from 1976 to 1997 during the summers and winters consecutively. From 1989 on, he invited his teachers to come to the U.S. to teach seminars to his students and his students' students as well. Now, he is one of the few highest ranking Choy Li Fut masters in the world. In 1987 he was promoted to grandmaster status by his teacher Great-Grandmaster Wong Gong. He is also a second-generation disciple of Yang Cheng-Fu, having studied under Dr. Hu Yuen-Chou, a closed-door disciple of Yang Cheng-Fu. Yang Cheng-Fu was the grandson of the founder of the Yang-style Tai Chi Chuan. Hu Yuen-Chou also promoted Doc-Fai Wong to the rank of Grandmaster of his federation for both Choy Li Fut and Tai Chi before his retirement in 1987. Doc-Fai Wong maintains his connection to the birthplace of his martial arts discipline; in April 2006, he raised all the funds for renovation the original residence of Chan Heung, founder of choy li fut kung fu in the King Mui Village of China for the Chan family to set up the house as a museum. Doc-Fai Wong is also a high level Chi Kung practitioner, being a longtime disciple and adopted son of Professor Peng-Si Yu and Min Ou-Yang, two of China's greatest Chi Kung and Yi Quan teachers. Doc-Fai Wong was the coach for the United States team competing in the Republic of China International Tai Chi Chuan Federation's World Championship Push Hands competition - an international tournament held every few years in Taiwan. In 1987, his team was the first and only U.S. team to win anything at this tournament, placing second only to Taiwan. The next time the tournament was held in 1990, Doc-Fai Wong's team again placed second. In October 2004, Grandmaster Wong took a largest U.S. team of 40 people to compete in the First World Traditional Wushu Tournament held in Zhengzhou, China. Doc-Fai Wong and his son Sifu Jason Wong each won gold and silver medals which brought home a total of 72 medals, 20 gold, 38 silver and 14 bronze medals from his team. At the beginning month of August 2006, Grandmaster Doc-Fai Wong accompanied by 50 students, headed to Zhan Jiang City of China to attend the First Traditional Wushu Invitational Competition, the "Hua Jian Garden Cup." His team members took home 63 medals, of which 45 were gold, 12 silver, and 6 bronze. In this competition, Grandmaster Wong and his son Sifu Jason J. Wong each won 2 gold medals. The competition was held in the Xu Wen County Public Square, and for two nights awed over 60,000 people who came to see the competition. In 1991 he was featured in Who's Who in California and was awarded the Kung Fu Artist of the Year by Black Belt magazine. He has also been featured on the covers of martial arts magazines more than 20 times, and has written over 200 Articles, produced several books and over 40 instructional videos. He has been a contributing editor of INSIDE KUNG FU Magazine since 1986. Doc-Fai Wong was selected as one of the top 50 most influential martial arts personalities in the world by Inside Kung Fu magazine in 1986, along with Bruce Lee and Jackie Chan. In 2003 Grandmaster Doc-Fai Wong was inducted into the Martial Arts History Museum's Martial Arts HALL OF FAME. Earlier that same year he was referred to as a National Treasure in a Special Edition of Inside Kung Fu Magazine. In the August 2005 issue of Inside Kung Fu magazine Grandmaster Doc-Fai Wong was picked as one of the Top 18 Greatest Sifus in America. 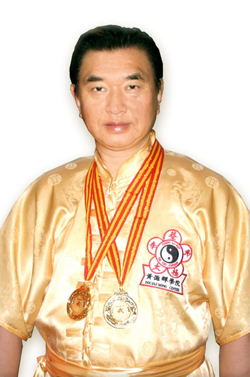 Grandmaster Doc-Fai Wong was selected as Inside Kung Fu Magazine's 2007 Instructor of the Year ! In addition to martial arts, Doc-Fai Wong is a feng shui expert and also practices Traditional Chinese medicine and in 1977 became a California state certified acupuncturist and holds a doctorate degree in Allied Health Sciences. Grandmaster Wong is the founder of the: Doc-Fai Wong Martial Arts Centers, Plum Blossom International Federation, Sanbao Ruyi Qigong system and DFW Productions, an online instructional video resource. He is the second generation keeper of the Ling-Nan Wudang Sword System. True Stories: The Legendary Fights of Doc-Fai Wong!